The most telling impact, however, has been made by ANO2011 the anti-corruption movement led by the Slovak-born billionaire Andrej Babiš, which has moved in a few weeks from relative obscurity to opinion ratings comfortably in excess of 10 per cent and is now regularly outpolling ODS and TOP09. A Czech Berlusconi in the making? Babiš’s movement, whose name loosely translates as A Discontented Citizens’ Action – and spells out the Czech word ‘yes’ (ano) in acronym – may, some polls suggest, have sufficient momentum to push it into second place or even hold the balance of power. The son of a Communist foreign trade official, who had lived for a period in Switzerland in his youth, the 59 year-old Slovak-born Babiš is an unlikely outsider. After a career working for state-owned petro-chemical trading companies under communism (including a stint in Morocco), he built up the Agrofert food and chemicals conglomerate, becoming a fixture in the country’s post-communist business elite. With a net worth of some $2 billion, he is now the second wealthiest individual in the Czech Republic. Babiš entered the political arena in September 2011 when he spoke out against levels of corruption and called for civic mobilisation against the political establishment. When no such movement materialised and attempts to link his nascent movement with regional independents faltered, he embarked on a process of top-down party-building. The result has been a solidly organised, well-funded and professional campaign which has been effective at getting across Babiš‘s central message: that he is a practical businessman who can get things done and will run the Czech Republic like a successful business. While mainly appealing to a disgruntled right-wing electorate, his calls for reductions in VAT and compulsory property declarations for politicians have also chimed with some left-wing voters. Polling also suggests that Babiš’s political novelty is increasingly proving a draw for undecided voters urgently seeking some form of visible change. The rise of a super-rich businessman turned anti-politician at the head of a movement, bearing all the organisational hallmarks of what Hopkin and Paolucci term the ‘business-firm’ model of party, has prompted inevitable concerns that Babiš is a ‘Czech Berlusconi’ in the making. Babiš himself has done nothing to dispel such fears by buying up the publisher of two of the Czech Republic’s main national newspapers and then telephoning their journalists to complain of their lack of coverage of his new party. Babiš may lack Berlusconi’s media clout and charisma, limiting the success of his movement – the (now defunct) anti-corruption party Public Affairs won similar levels of support in 2010 for a fraction of Babiš’s effort and outlay. But his rise underlines the increasingly fragmented and fragile state of Czech politics – as well as the growing difficulties of maintaining even a semblance of normal party government. Although they are certain to emerge as the largest party – and may have up to seven or eight parties sitting in parliament to choose from – the Social Democrats will struggle to find partners to form a stable, coherent governing coalition with. While the Christian Democrats would be unproblematic, the opaque and faction-ridden pro-presidential party SPOZ would be an unpredictable ally, giving president Zeman unwelcome political leverage on the government. 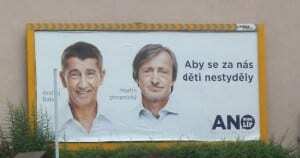 Andrej Babiš and ANO2011, while not beyond the pale, are still a more unknown quantity and have been ruled out by Social Democrat leaders as a right-wing vehicle for commercial interests. Co-operation with TOP09 – favoured by some centre-left modernisers – is politically unacceptable to most Social Democrats. The one remaining government option may be to strike a deal with the Communists (KSČM). The Social Democrats are banned by a long-standing conference resolution from forming national-level coalitions with KSČM. However, a pact trading policy concessions (probably on domestic issues) for Communist parliamentary support for a minority Social Democrat government would be relatively straightforward to conclude. The two parties have worked smoothly together in regional government and, unlike most newly emerging groupings, the Communists are a predictable and well-structured party. It is not without irony that the Czech Republic’s much reviled Communists may be the country’s best hope for stable, programmatically coherent party government – although the prospect of their regaining national influence will horrify many. But the real threat to Czech democracy arguably lies elsewhere. Some of the last published opinion polls have suggested that the Social Democrats’ slide is such that even turning to Communist support would leave the party short of a working parliamentary majority. In this scenario, the party might have little choice but to contemplate co-operation with Andrej Babiš’s movement or even to entertain the previously unthinkable idea of a Grand Coalition with right-wing parties of the outgoing coalition. If the parties of the Czech left cannot do any more than patch together yet another weak minority government, they too may find themselves enveloped by the same toxic mix of corruption, socio-economic frustration and anti-political protest voting that has already consumed the right. It seems that the Czech Republic is set for another ‘earthquake election’ which may reduce one of Central and Eastern Europe’s most consolidated party systems into a fractured political landscape of niche groupings, personal vehicles and business-driven ‘project parties’. Seán Hanley is Senior Lecturer in East European Politics. His research interests include the emergence of new anti-establishment parties in Central and Eastern Europe. He will be discussing the results of the Czech elections at a roundtable event at University College London on 28 October with Tim Haughton of the University of Birmingham and Katya Kocourek of the Economist Intelligence Unit. This piece was first published in the EUROPP and is reproduced here under the terms of a Creative Commons license (CC BY-NC-ND 2.0).